Unknown. Currently it is believed that the probable author was a Norman poet, Turold or Turoldus. His name is introduced in the last line. 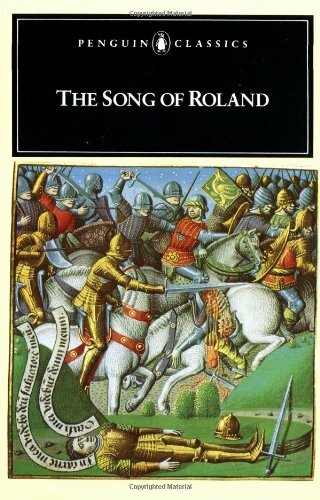 It has previously been argued that Taillefer, William the Conquerer's jonglear, was the author of the Song of Roland. Roland is in many ways the perfect knight. Strong, courageous, and honorable he is loved by his king, Charlemagne, and worshipped by his men. He has only one enemy, his stepfather, Ganelon. When given the chance Ganelon betrays his king, his country and his people to take revenge on Roland. The story begins in Spain where Charlemagne has been harrassing the Saracens (a medieval term for Muslims) defeating them in many battles and besieging their major cities. The Muslim king Marsilion hatches a plan to trick Charlemegne into leaving. He promises Charlemagne many lavish gifts, tribute, and hostages if he will go back to France and wait for Marsilion to follow. He further promises that when he comes to Charlemagne's court to swear loyalty to him, he will also convert to Christianity. Charlemagne beleives him and prepares to leave. He sends Ganelon, at Roland's suggestion, to take the message of his acceptance to Marsilion. Ganelon uses the opportunity to create a plan to kill Roland. He promises the Saracens that he will support their plan and arrange for Roland to lead the rear guard that will protect the Charlemagne's back as he turns for France. He arranges for the Saracens to attack Roland's forces with a much larger force. The plan goes just the way Ganelon predicts and Roland is ambushed. When they realize the size of the Saracen force, Roland's friend Oliver tries to convince him to blow his great horn, Oliphant, for help. Roland refuses to blow the horn and the French fight a magnificent battle, but they are overnumbered and the tide turns against them. Although, Roland knows it is too late far any help to come, he blows his horn so that Charlemagne will know what happened to them. Soon after he is struck in the head and dies, going directly to Paradise. When Charlemagne arrives, he grieves deeply at the death of his men, particularly Roland. He first allows his army to chase the fleeing Saracens into a river where they drown. Then he gathers them to grieve and bury the dead. The Saracens return with reinforcements under the Emir, Baligant, and meet Charlemagne's forces in battle. The battle is fought fiercely on both sides but Charlemagnes forces prevail and the Saracens flee. Charlemagne returns victoriously to his court in Aix with Marsilion's wife hwo has sworn to embrace Christ. Soon after the battle, the Franks dedeuce Ganelon's treachery and he is brought back to Aix in chains for trial. Found guilty in a trial by combat, Ganelon is subjected to a painful death as a traitor. This page was last modified on 14 January 2018, at 20:22.